14k white gold panther ring with 3.6110 ct of black diamonds. The perfect accessory for a day on the prowl. 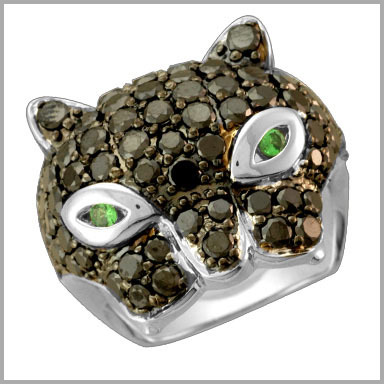 Crafted in polished 14K white gold, this panther head shimmers with 83 full round cut black diamonds in pave settings. They eyes glow with two round cut 0.0300ct Tsavorite in chanel settings. The total black diamond weight is 3.6110 ct and the total Tsavorite weight is 0.06ct (both approximate). The setting size is 6/8" x 7/8" with a height of 5/16".